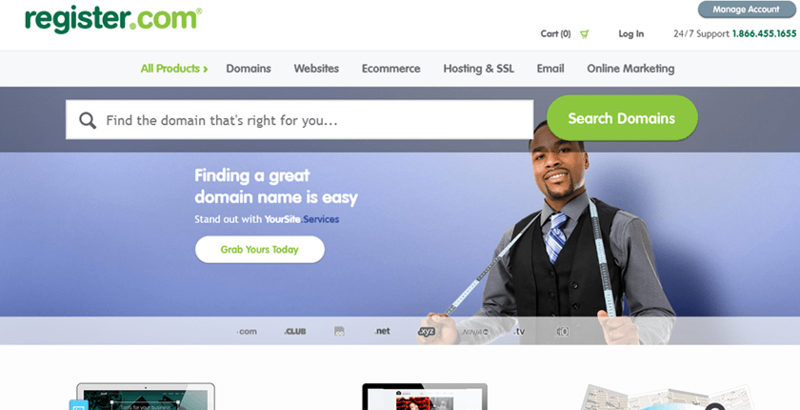 Register.com Review 2019: Is Register.com a Good Hosting? Register.com has features are on par or exceed those of the most expensive providers. They offer massive storage and features making them suitable for almost any website. Register.com has been in business since 1994 providing various web hosting services. They were acquired in 2010 by Web.com and has continued to grow. They presently manage over 2.5 million domains and provide outstanding website services at reasonable prices. Where most sites provide 1 to 2GB on a basic plan, you get no less than 300GB on hosting plans with Register.com. You also get plenty of email boxes with ample storage, autoresponders, and more. Power users and professional website designers will appreciate the advanced features. Also, you have the option to host your site using Windows-based or Unix-based hosting. Most only offer Unix hosting. While Register.com offers some fantastic features, they are not ideal for rank beginners. A site builder is included in hosting with some drag and drop features, but you will need to know how to code some. For those wanting to use WordPress or other CMS software, there are auto-installers available. You will need to know at least some coding knowledge or be comfortable using tutorials to use this platform. The one caveat to the Essential and Professional plans involves MySQL databases. They are limited to just 300MB each. If you need large databases, then you will have to upgrade to Premium, which has no limits on databases. Register.com has fantastic customer support with toll-free phone support in the U.S. and Canada, chat and email support. The one catch is they are only open from 9 am to midnight Monday through Friday, and 9 am to 10 pm on weekends. I contacted support through live chat and received a response in under 30 seconds. Agents are native English-speaking and very knowledgeable. This is likely due to support receiving 120 hours of training with 115 hours of follow-up training each year. There are hosting options that are cheaper than Register.com, but you get what you pay for. Few hosts offer more storage than Register.com and their value-added features are on par or exceed those of more expensive hosting providers. This is the perfect provider for those needing lots of storage or those wanting advanced features without paying a premium. Wondering how Register.com stacks up against other Web Hosting companies? Enter any other Web Hosting company and we will give you a side-by-side comparison.